The summer is so close, we can almost smell it! As you all know, May and June are particularly tiring months with report-writing, squeezing in the last curriculum objectives and dealing with the energetic behaviour that comes part and parcel of the approaching summer holidays. So why not get a headstart on organising your classroom so that you're not trying to deal with it in the last week of school when your energy is well and truly drained? Here are my suggestions for 5 simple tasks. Set out some time to do these over the coming weeks, in whatever way suits your schedule and you'll thank yourself when the final week rolls round. You might need to break down these tasks into smaller parts. I, for one, could only face one desk drawer at a time! 1. Deal with your drawers! I decided to start with this one because it was pretty messy. Though my cupboard is much more painful to look at, I couldn't face that as my first task for fear of being disheartened! I have that habit of just throwing anything and everything in my desk drawers. I picked up a cheap drawer organiser to help me out. 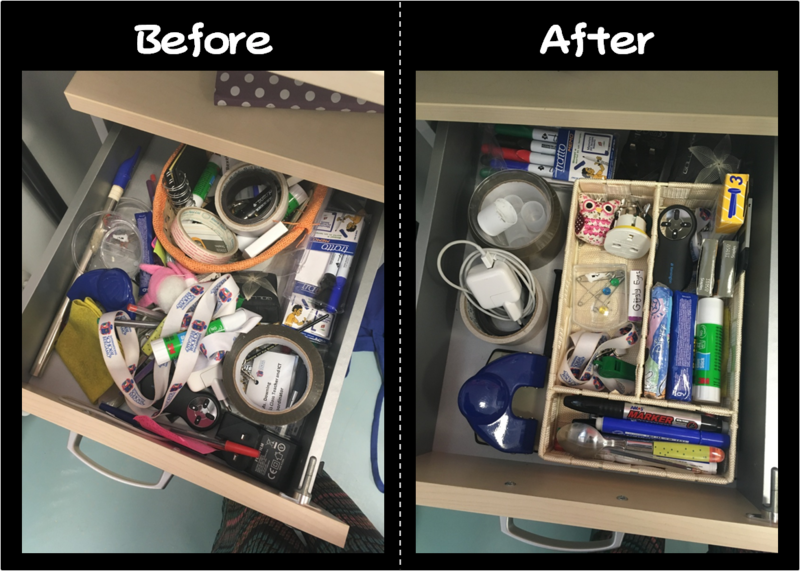 I was inspired by one of my colleagues who used simple plastic containers to split her drawer into compartments. It looks so organised! I already feel so accomplished! Admittedly I keep my desk relatively neat and tidy. However I know a lot of you out there have desks that look like a bomb just hit it. So get on it, sort it out! If your problem is caused by lesson resources hanging around, go and invest in a set of 5 A4 drawers (mine is pictured below). This has made my life infinitely more organised. It's so easy to check if you have photocopied everything you need for the next day and it saves sifting through unnecessary piles of copies. I know I'm not the only one who has a tidy classroom on the outside but a cupboard full of resources just dying to burst out at any moment. Every time I tidy it up, I vow to keep it in order and every year I end up creating an ungodly mess in there. If you can't see it, it doesn't exist, right? 4. Sort out THE PILE! THE PILE deserves capital letters. We all have one. It's that pile of paperwork waiting to be filed, it's the laminated resources you want to keep but never put into folders, it's the random sheets on your desk that you thought might be useful but you didn't bother finding a home for them. 5. Do a techy tidy! This is one that can often be neglected. Many resources get saved under names that make them difficult to search for. Rename anything unrecognisable. Lots of files get thrown into a big folder with no real order. If you haven't already done so, have a folder for each subject area/year group and subfolders for each curriculum area/strand/unit/topic. Tidy up your desktop. Delete unnecessary files. Sort out your school email. Delete anything you don't thing you'll need in the future. Oh, and most importantly, BACK EVERYTHING UP!!!! With all 5 of these tasks tackled, you'll feel like the summer is so much closer!